Waldorf-Astoria Interior. Image Credit LPC. Art Deco lobbies, galleries, staircase, a ballroom and their connecting spaces over three floors of iconic hotel to be considered for interior landmark status. 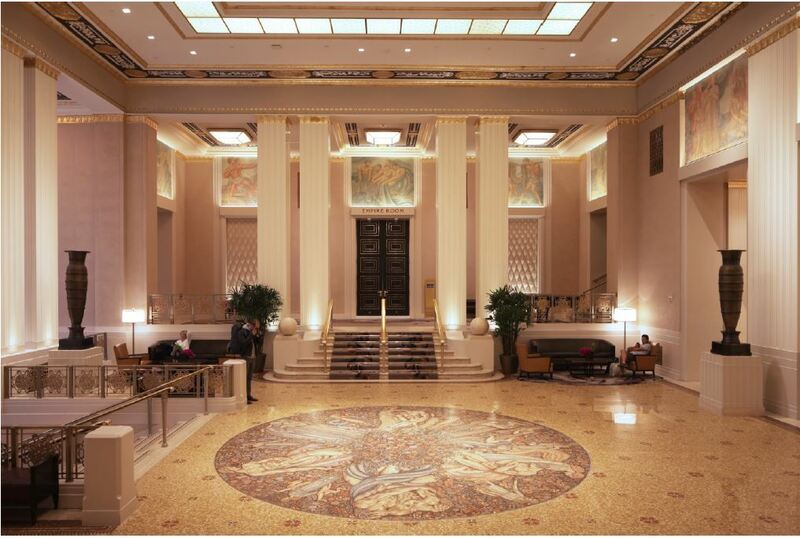 On November 1, 2016, the Landmarks Preservation Commission added interior spaces of the Waldorf-Astoria Hotel at 301 Park Avenue to its calendar, the first formal step in the path to designation. The 1931 hotel, designed by the firm Schultze and Weaver, is already an individual City landmark, but its interiors are unprotected. The proposed designation encompasses select spaces on ground floor, first floor, and third floor, as well as the connecting spaces between them. Schultze and Weaver were prominent designers of high-end hotels in the 1920 and 30s, and Partner Lloyd Morgan was the lead architect on the design of the Waldorf-Astoria. Chinese investment firm Anbang acquired the hotel in 2014. The new owners are planning to shutter the hotel while they undertake an extensive restoration of the property. The hotel will be partially converted to condominium use. The significant areas identified in the proposal are the Park Avenue Foyer, the main lobby, the first-floor elevator arcade, double staircases leading to the mirrored Silver Gallery, the Grand Ballroom, and the third-floor Basildon Room, Jade Room, and Astor Gallery. Gilded plaster, mirrored walls and marble thematically unite the hotel’s interior spaces. Important features include the murals on the Silver Gallery’s coved ceiling, the staircases’ “frozen fountain balustrades,” and the wall and ceiling panels in Basildon Room salvaged from a British mansion. The Grand Ballroom is one of the City’s largest event spaces, and is famous for its society gatherings, including the annual Alfred E. Smith Dinner. Commissioner Fred Bland commented that the Waldorf-Astoria possessed “one of the most distinctive interiors in the City,” and that it was shocking that it had not yet been designated. Bland further noted that the Waldorf-Astoria was the subject of a chapter in Rem Koolhaas’s 1978 manifesto “Delirious New York.” Chair Meenakshi Srinivasan said that the Commission had an opportunity to “acknowledge and celebrate” the hotel’s interior spaces, and thanked the owners for their cooperation. No date was set for a public hearing on the potential landmark. LPC: Waldorf-Astoria Hotel Interiors, 3012 Park Avenue, Manhattan (LP-2591) (Nov. 1, 2016).